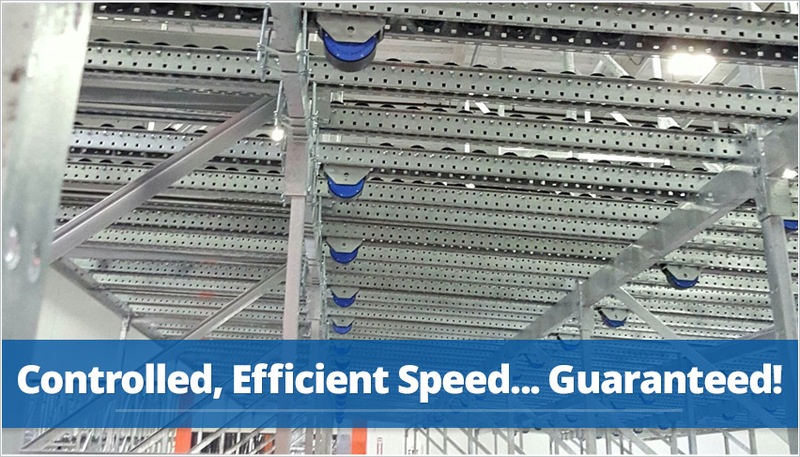 Speed controllers provide a necessary control mechanism to maintain a safe, measured pallet flow or speed as they advance down the lane. Acting as a sort of braking device, the speed controller slows the pallet and prevents it from gaining too much speed in the gravity-inspired process. Slowing the pallet provides better lane tracking which helps ensure that the pallet arrives squared with the lane opening at the pick face, thus facilitating a faster, easier forklift extraction. Mallard drop-in speed controllers can be installed on-site for all wheeled tracks and narrow roller track applications. Our most popular controller type, drop-in assembly is quick and easy, requiring minimal hardware. Mallard speed controllers are available in light, medium and heavy-duty options to best meet your pallet flow inventory needs. With simple to access tools and few minutes of time, your pallet flow system can be enhanced with safety and efficiency boosting drop-in speed controllers. Place the speed controller in the opening between the wheels. Be sure the arrow is aligned with the direction of flow. Insert the bolt and snuggly tighten the acorn nut being careful to not overtighten. Repeat process for all speed controllers.